Ghorza: "Tacitus? What is this?" Ghorza: "Is that what you call it? In the Legion we would have called it 'useless.' Look how brittle the metal is!" Tacitus: "I... I'm sorry. I just, well, the forge gets so hot and I thought...."
If you retrieve a book about smithing for her, she will give you a free lesson in Smithing and become a potential candidate for marriage. She will also make you Blood-Kin to the Orcs, granting you access to all Orc strongholds, if you don't already have such access. She wakes up at 8am and goes straight to the workshop with Tacitus. They work there until 8pm, when they return to Understone Keep for a four-hour dinner. Ghorza then sleeps there at midnight in a room she shares with her brother. Ghorza wears a blacksmith's apron and a pair of shoes. She is equipped with an iron dagger and carries a selection of common items and gold. When you are near her, Ghorza may offer you her goods by saying things like "Need a new blade? ", "Got an axe here. Good for cleaving up Forsworn. ", "How about some armor? ", "You'll want some thick armor if you're traveling the Reach alone." At other times she will denigrate her hapless apprentice with comments such as "Don't bother with Tacitus. Useless." and "You'd think an apprentice could forge a few hinges. Not Tacitus." Upon ending conversation with her, she can be found saying either "Let me know if you need something forged." or "Back to making weapons." You can ask her what is wrong with her apprentice, to which she'll reply, "Tacitus? Boy's an Imperial. I keep showing him how to treat the iron, but he never gets it. In the Legion, the Imperial smiths used to read books when they couldn't set their hammers straight. Wisdom of the old, I guess." She'll then ask you, "If you find a book called 'The Last Scabbard of Akrash,' could you bring it to me? Tacitus sure isn't learning by example." You can tell her you'll bring one if you find it, and she'll say, "Thanks." Alternatively, you can say that you don't have time. She'll instead reply, "Fair enough." Once you've found the book she requested, you can give it to her. She'll answer, "Books. Don't know why the Imperials like these so much. This should help the boy, though, Malacath willing. Here, let me show you how an Orc learns to smith." She will then give you a free training lesson in Smithing. If asked where she learned to smith, Ghorza will tell you, "Grew up in a stronghold. Every Orc girl tended the forge at some point. But a girl has to grow up, and life in the stronghold asked for a lot in return, so I joined the Legion. Mastered my trade there." You can further ask her if she grew up in a stronghold, which she'll confirm with "That's right. An Orc stronghold. Kept to ourselves. Lived as our ancestors would have wanted. Wasn't enough for me, though. I left. Didn't want to end up as the third wife of some lowly chieftain." Tacitus: "When will I learn how to forge weapons and armor? Isn't that my job?" Ghorza: "You strike your metal like a new mother giving her babe a light slap. Hit it harder." Tacitus: "I'm sorry, Ghorza. I just... flinch, and uh...."
Ghorza: "If you can't pound the dusk out of your iron, it'll break when it's finished. Hit. It. Harder." Skilled Apprenticeship: Retrieve a skill book for Ghorza gra-Bagol. This is the merchandise found in Ghorza's merchant chest. These items are only available if purchased from the merchant; they cannot be pickpocketed or stolen. They are restocked every two days. This issue has been addressed by version 3.0.1 of the Unofficial Skyrim Legendary Edition Patch; investing in Ghorza's shop will no longer add to Moth's investment pool in addition to her own. When you talk to her, there may be an option to invest. When you select it, the only available option is to cancel the investment. If you're willing, you can kill Ghorza to get the investment option through Tacitus instead. 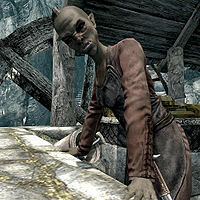 She may be the target of a Thieves Guild quest, where you have to pickpocket an item from her. It is possible to receive this quest even if she is dead. Quitting the mission will allow you to take another instead. You can receive two Death Notices for her at the same time. ? Sometimes, Ghorza will not serve as a Smithing trainer.